Activeaire Freshener Refill Features A Citrus Fragrance That Delivers The Crisp Scent Of Handpicked Fruit, Lemon And Mandarin With Subtle Hints Of Pomegranate And Sandalwood. Its Easy-To-Maintain Design Can Be Installed Quickly And Easily To Minimize Maintenance Times. Sustained Release Provides Long-Lasting Fragrancing To Keep Restrooms Smelling Great For At Least 30 Days. Plus, The On-Trend Fragrance Can Be Matched With Other Activeaire Supplies To Keep A Consistent Experience In Restrooms. 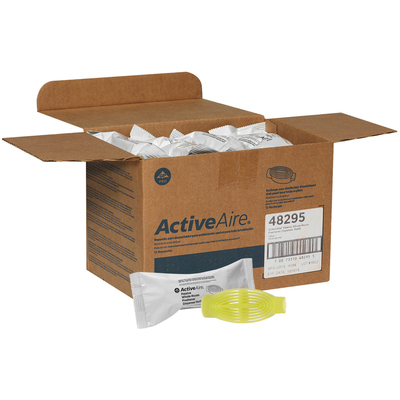 Passive Freshener Refill Is Designed For Use With Georgia-Pacific Activeaire Whole-Room Freshener Dispensers (Sold Separately)..
Activeaire Freshener Refill Features A Citrus Fragrance That Delivers The Crisp Scent Of Handpicked Fruit, Lemon And Mandarin With Subtle Hints Of Pomegranate And Sandalwood. Its Easy-To-Maintain Design Can Be Installed Quickly And Easily To Minimize Maintenance Times. Sustained Release Provides Long-Lasting Fragrancing To Keep Restrooms Smelling Great For At Least 30 Days. Plus, The On-Trend Fragrance Can Be Matched With Other Activeaire Supplies To Keep A Consistent Experience In Restrooms. Passive Freshener Refill Is Designed For Use With Georgia-Pacific Activeaire Whole-Room Freshener Dispensers (Sold Separately).